Join us online at meet.google.com/goo-mzmz-pke. 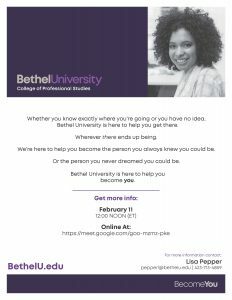 This entry was posted on February 11, 2019 by Bethel Marketing. This entry was posted on November 14, 2018 by Bethel Marketing. Join us at 5:30 p.m. EST! This entry was posted on July 13, 2018 by Bethel Marketing. Join us for a virtual information session at 11:30 a.m. EST. This entry was posted on July 10, 2018 by Bethel Marketing.